String height and tension typically determine the ease with which the strings can be depressed. This description of playability is called string action, and is determined by the distance from the strings to the top of the frets. Depending on technique or playing style, high action can make playability difficult; low action can cause string buzz. Most electric guitars have height-adjustable bridges or bridge saddles that allow easy adjustment of string height. Most acoustic guitars, however, do not have height-adjustable bridges or bridge saddles. To lower string action on these instruments, the bridge saddle must be removed, cut down to the desired height and re-installed. To raise string action on these instruments, the bridge saddle must be replaced with a higher one. Please note that action adjustments on acoustic guitars should be performed only by qualified repair personnel. String tension exerts tremendous bending force on guitar necks. Temperature and humidity can also cause neck bowing. Gretsch guitars (except for lap steels) have an adjustable truss rod running the length of the neck that counteracts bowing, strengthening the neck and ensuring straightness. A truss rod that’s too loose can allow concave neck bowing that raises string action too high; a truss rod that’s too tight can create convex neck bowing that results in low action and fret buzz. 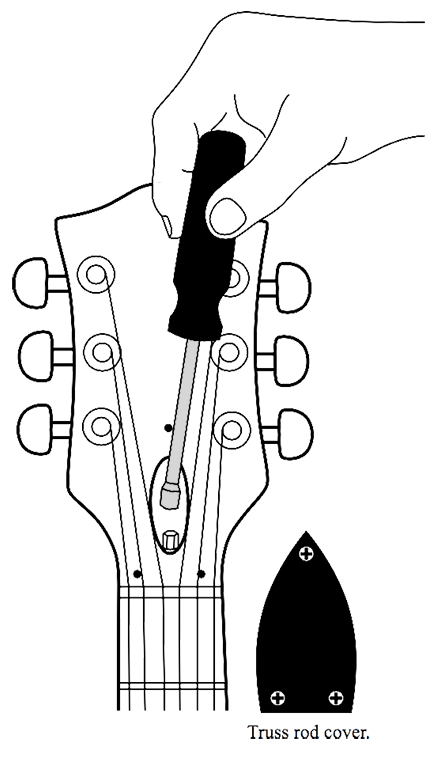 To adjust the truss rod, first remove the truss rod cover from the headstock (the instrument should remain tuned to pitch during this procedure). Insert the proper size truss rod adjustment wrench (provided with new Gretsch instruments) into the truss rod nut or use a correctly sized driver (see illustration at right). If the neck has a concave (dipping) bow, tighten the truss rod nut by turning it clockwise. If the neck is has a convex (humped) bow, loosen the truss rod nut by turning it counterclockwise. Adjust the truss rod nut only a quarter turn at a time, allowing time for the wood to settle and sighting down the neck after each adjustment. Be careful not to over-tighten the rod. If you meet excessive resistance or prefer not to make this adjustment yourself, take your guitar to an authorized FMIC service center. Please note that truss rod adjustments are considered routine maintenance and are not covered under the Gretsch warranty. Showing adjustment with 5/16” nut driver on a Professional Series instrument. Remove truss rod cover from headstock. Using appropriate tool, turn truss rod nut gently.